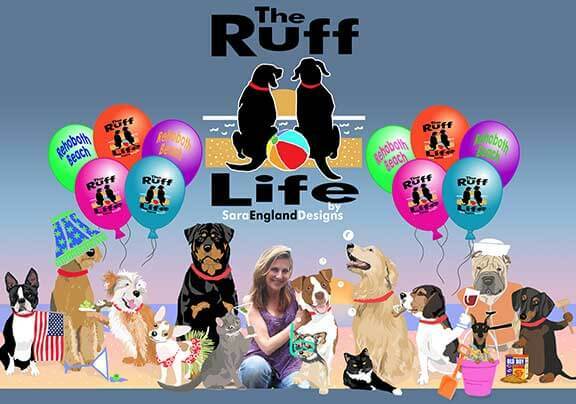 Rehoboth Beach, DE – Accomplished artist and dog lover Sara England opened a dog art beach boutique in the spring of 2017 – ‘The Ruff Life’, featuring her fun, whimsical pet-themed art on dozens of unique products! Sara’s sense of humor shines through her creations as she mingles her happy style with the essence of the dog breeds to create art of liveliness and authenticity. “I am inspired by the special bond between dogs and their people. That relationship is one of the reasons we’re very excited about this new venture! For the past few years, we’ve been travelling the country attending dog shows as a vendor. I’ll now be able to focus more on my true passions…customizing art for pet lovers and working with local animal welfare organizations to further their missions of hope and a future for neglected dogs and cats,” explains Sara. Located a block from the Boardwalk, at 46 Baltimore Avenue, ‘The Ruff Life’ opened May 1st 2017. Sara’s art is featured on giclée-quality prints, sandstone coasters, cheese platters & cutting boards, personalized Tees and many more home decor products creating a vibrant array one of a kind keepsakes. Customers can also choose to have their gifts customized, personalized and made while they wait. “It makes my day when a customer tells me that their daughter’s favorite gift was my ‘Sunset’ design depicting her two dogs at the beach. I love that I can connect with and touch people through my art,” muses Sara. Please stop in and say hello to Sara, her husband Michael and their rescued 8-year-old Chance....We're open year-round! !